I figured out what, for me, is the hardest yoga pose. I used to think it was a headstand, crow, firefly, or peacock. But as I continue to get stronger, I’ve realized that I’m getting closer to these poses, and can hopefully do them one day. So what’s the most challenging pose that I may never get right? Also known as “corpse pose,” savasana ends every yoga practice. You simply lie down on your back, close your eyes, and play dead. Oh, and rid your body of all thoughts. No big deal. I always look forward to the end of a yoga class, because savasana is really one of the only times I truly let myself chill out. As soon as my alarm goes off in the morning, I jump out of bed (what’s a snooze button?) and I go go go for 15 or however many hours before I retreat back to bed (where I just dream of something chaotic or weird, so even then my mind’s a goin). For some reason, I have never known how to slow down. Still, I end my practice on the mat and my mind keeps wandering. Perhaps the yogi gods were challenging me as I thought about this the other night. I was returning home from Laura’s apartment on the UWS (it was late), and was greeted with an L train that wasn’t arriving for…an hour. Do I call a friend that lives in Manhattan? Do I take a $20 cab? Do I sleep in the office? (which I actually almost did) Or do I just sit…and wait? The first ten minutes of my decision making was put on hold, because I ended up talking to an old man. 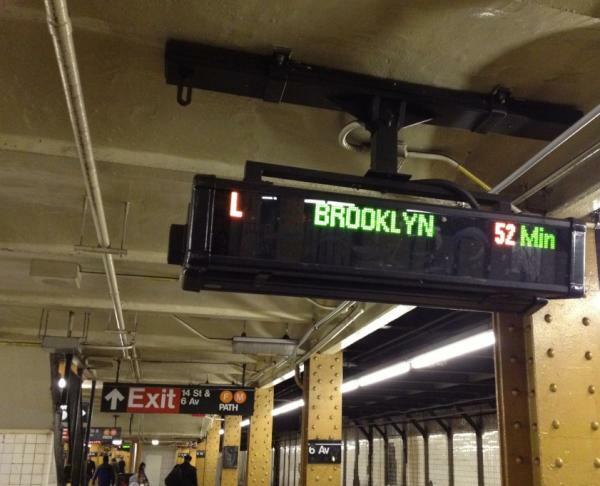 He assured me that there were worse things in life than 52 minutes till the L, which I more or less had to agree with. We talked about tornados in Mississippi, wars in Sudan, and homeless people on the streets. Clearly, I could wait an hour. So I did. I unplugged my headphones, put away my moleskin, and sat on the 6th avenue L platform at 12:30 on a Monday night. (My old friend at that point jumped on a train going in the opposite direction.) And I thought about savasana. Now, I didn’t lie down on the subway platform (wouldn’t put it past me , though). But I did sit as quietly as I could, trying to avoid thinking about the day at work, what I had to finish up at home, if Ali would even hear me call her and let me in our apartment (she had my keys), or how cold I would be walking home (it was 28 degrees). And for some crazy reason, I was able to just sit on that platform and escape from every thought, worry, or question, for an hour. Traveling far away from the city that was right above me. I didn’t let go completely, but it was good practice. And especially as of late, it’s easy to feel a little trapped in the big city. Yet I’m beginning to learn that it’s not always our surroundings we’re trying to get away from, but how we feel when around them. And letting yourself do absolutely nothing is imperative to recovering, recharging, and simply allowing yourself to take a break from all of life’s stimulations (the good and bad!). That, or to help make waiting for a train not so terrible. Posted on March 9, 2012, in Uncategorized. Bookmark the permalink. 9 Comments. I’ve been in that position so many times, and have never quite thought of it like that. Thank you for sharing! of course 🙂 thank you for reading! OMG 52 minutes is insane. You absolutely should have come back to my place! If you are EVER in that position again, seriously, just come over! hahah i was going to call you! But then i was talking to this man… and then i wanted to try and be all zen….you know..ha. But yeah, been thinking about this a lot recently, and yr blog post reminded me to write this one! It is considered one of most important & most difficult poses of yoga. Including Shavasana in your daily practice have so many wonderful benefits although this may differ from one person to another. I personally experienced correction of body alignment. Love this post, it’s so true…letting go and disconnecting is just so hard sometimes! My yoga teacher always says it’s like training a puppy…you tell them to sit and they sit for a second and then get up, you have to call them back and tell them to sit again…and again…and again…until they get it! We have to train ourselves to be able to do the same thing with our minds…when it wanders we have to call it back…definitely the most challenging pose! absolutely. I love that analogy! I try to meditate every now and then to help with savasana, but my mind still races!